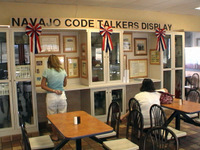 Navajo Code Talkers Exhibit at a Burger King? Navajo Code Talkers Exhibit: Would You Like Fries With Your History Lesson? 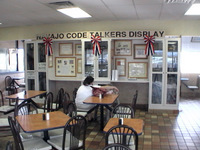 Imagine our surprise when we learned that the Navajo Code Talkers Exhibit in Kayenta, Arizona is located inside the small town's Burger King. I mean, there's a perfectly good Sonic Restaurant just down the street. Why not put it there? We had never seen such a collaboration between corporate America and American history, but then again, Kayenta isn't a typical town. Somehow, it works. 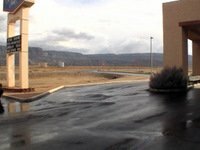 Walking out of the Kayenta Hampton Inn just minutes after a desert thundershower. The Hampton Inn was one of two major hotels along Highway 160. We found it clean and comfortable, and we recommend it for travelers who are passing through the Navajo Reservation. Ah-ha. 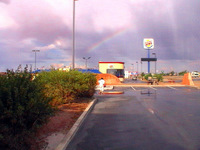 There's the Burger King. And it has to be the only one in town. 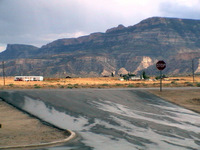 Kayenta has just 5,500 residents. Still, that makes Kayenta the major city on the Reservation. It looks like any other Burger King. There's no special Navajo decor on the outside. This is nothing like the train-themed McDonald's we saw in Barstow, California. The view across the street. It's nice to visit a fast food restaurant that doesn't just face another strip mall. 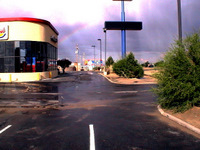 This goes to show you that even a fast-food meal can be enjoyable if you eat it in a scenic location along the course of your road trip. And there's the exhibit. There's not a whole lot to it, but they've arranged it nicely against one wall. It's definitely worth a two-minute browse as you wait for your food. Reading the guest book made us feel like we were really on a road trip. People from all over North America had shared their names, addresses, and comments. How many people have passed through and seen this exhibit? At the risk of sounding like a broken record, you can't see this stuff if you fly instead of drive. Take some time to learn about the Navajo Code Talkers. They probably deserve their own museum somewhere, but then again, it's nice and convenient that you can access this little exhibit any time the Burger King is open in Kayenta, Arizona.